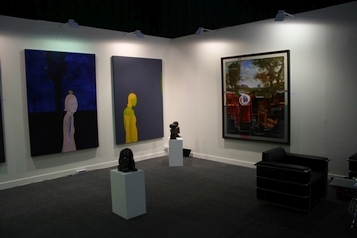 ART SAWA WILL BE PARTICIPATING FOR THE FIRST TIME in the prestigious art fair. Art Sawa, which translates into Art Together, is a venue that facilitates and fosters interaction, dialogue and inspiration through art, between artists and the public across the Middle East. The gallery is considered one of the most significant galleries in the region as it offers a distinctive art platform for artists from the Middle East, North Africa and neighboring countries. In setting up Art Sawa, it was our vision to create a space where people could freely interact and discuss the issues raised through art, and we are extremely honored and privileged to be hosting these important exhibitions, which highlights the culture of the Arab world. In less than two years, Art Sawa has organized and curated exhibitions for an array of regional contemporary artists working in painting, sculpture, photography, video and new media. These exhibitions examine the work of both emerging and well-established artists whose work impacts contemporary art and culture.